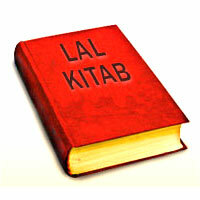 Philosophy explores the meaning of life and its relation with society, country and the universe. Though both philosophy and science deal with the world of our experience, science is critical and experimental while philosophy is the conscious reflection upon the world. Should we define philosophy as a pursuit of knowledge ? In fact, it is the branch of knowledge that intends to harmonise and systematise all truths and rational conception of the reality as a whole. The various aspects of philosophy are: •	To enquire into the nature, origin, validity of the world, soul and God (Epistemology, Epistome = Knowledge). •	To enquire into reality of the nature of the world, life, soul and God (Ontology, Onto = reality) •	To enquire into supreme norms (values) of life, i.e, moral, aesthetic & religious values (Axiology) A philosopher, saint or seer has the mysterious power to hypnotise the masses by his individuality, personality, temperament and super consciousness of mind. Astrologically, these good propensities are conferred by the sign and its lord rising at the time of birth of the native. It is a well known fact that strong state of ascendant and its lord provide an abundance of energy to produce effective impacts of divine knowledge, high spirit, friendly and sympathetic attitude on the mind of the masses. Lord Krishna was born in Taurus, Lord Rama, Ramanuja, Bal Gangadhar Tilak, Sri Aurobindo in Cancer, Dr. S. Radhakrishnan in Virgo, Swami Chaitanya in Sagittarius ascendant. Lords of all these ascendants lead to animation, philanthropy and serenity in the natives because they are well placed and fortified. Natives with weak ascendants have sluggish nature, survive in anonymity and can not focus their inherent energy in exploring something new. Their deeds may lead to animalism. The mutable signs Gemini, Virgo, Saggitarius and Pisces are benevolent and placid who affect the super conscious mind directly. Consequently, a unique individuality emerges out which is not influenced by external perturbation. These signs are also imaginative and sensual. Natives born in these signs with their fortified lords get success on their paths and are honoured by perquisites of name, fame and prosperity in the fields of education, literature, justice, business, religion and philosophy. They are not suitable as administrators and soldiers in battle fields. Although Pt. Jawaharlal Nehru was born in Cancer and Dr. S. Radhakrishnan in Virgo, they were at the highest posts of the country yet they were at first thinker, writer and philosopher rather than an administrator. In chart of Pt. Nehru, the three planets, lord of ascendant Moon, lord of 4th & 11th house Venus and lord of 6th & 9th house Jupiter are in their own houses and hence gained much strength. Although ascendant lord Moon is hemmed by two malefics yet it is not aspected by any good or bad planet. Simultaneously, the disposition of benefics on either side of the Sun and disposition of Venus in its own sign produced Ubhayachari and Malavya yoga. They bestowed Pt. Nehru an attractive, impressive, imaginative, sensitive and philanthropic personality with writing skill. He was a seeker of an environment of peace, socialism, serenity and democracy in the world. He was not a shrewd politician. Otherwise, he would not have believed on China for peace and would have got prepared himself for battlefield. The Jupiter is with malefic Rahu making Guru-Chandal Yoga who inspired Nehru to be an agnostic. Astrologically, Sun, Moon, Mercury, Jupiter and benefic Saturn are auspicious, gracious, social, and philosophical planets. Moon and Mercury represent the mind while Jupiter represents the ability of the mind to conceive animism, asceticism, humanism and socialism. The doctrine of Hinduism concentrates on Brahma and self which are signified by Great Cosmic Whole and the Sun respectively. 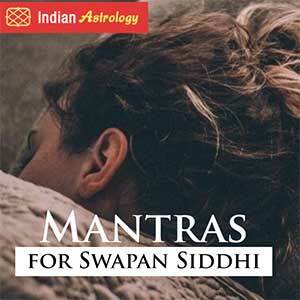 We get an idea about self-realisation (Atma-gnana, Atma-vidya) through the position of the Sun in horoscope. Unless the Moon and Mercury are on a sympathetic wave with the Sun, philosophical achievements are unsatisfied. Thus natives dominant by proper combinations of these planets sublimate their ignorance and passion, and then they gain positive attributes of humanity. Consequently, the natives become conscious, sensuous, erudite, thinker, and self-aware. Influence of Mars and shadowy planets on these planets decline their nobility, sense of humour and induce the philosophy for the purpose in battlefields. Mantreshwar in Phaladeepica says, एकक्र्षसंस्थैश्चतुरादिकैस्तु ग्रहेर्वदेत्र बलान्वितेन। प्रव्रज्यकां तत्र वदान्ति केचित् कर्मेश तुल्यां सहिते खनाथे।। अध्याय 27, श्लोक 2 “If four or more planets are posited in a single house the native will become an ascetic of the order indicated by the strongest among the planets. Some say that if the lord of the 10th house be one amongst those planets, the native will take to the order of asceticism signified by the lord of the 10th house.” Such a statement is observed in Jataka parijat, chapter 15, shlok 15-40. The planetary combinations and their dispositions indicate the state of asceticism regionalism and renunciation of the native even if he is born in an aristocratic or royal family. In fact, philosophy is purely a mental, logical, introspectional, and emotional exercise. 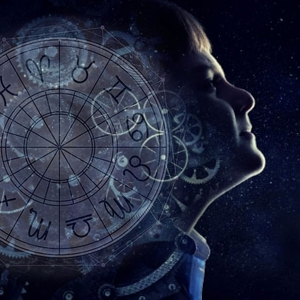 It is a general rule of astrology that if the Sun is positive, aggressive, enthusiastic and self-assertive, the Moon is negative, defensive, inhibitive and defensive. 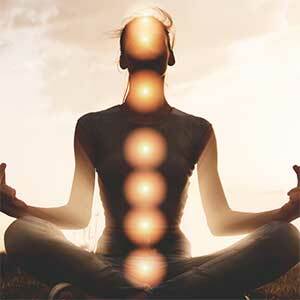 The combination of both Sun-Moon is conducive to placidity. The Jupiter is religion, knowledge and salvation while the Saturn is ascetic, deep thinker and philosophical. Therefore some conjunction of these planets like, (a) Sun-Saturn, (b) Moon-Saturn, (c) Mercury-Saturn, (d) Jupiter-Saturn, (e) Sun- Moon (f) Sun-Rahu (g) Moon-Ketu (h) Sun- Mercury -Venus, (i) Sun-Jupiter-Saturn, (j) Sun- Moon- Mercury are responsible to produce, (a) A firm and steady desire to explore the secrets of nature, (b) Perseverance and diligence to find the path of desire and (c) A craving for knowledge essential for deep thinkers and philosophers. (d) Devotion and renunciation. The Mars, Venus, and Rahu are passionate as they denote anger, aggressiveness, excitement (characteristics of Mars); physical attraction, physical comforts, lust, selfishness, strong enthusiasm (characteristics of Venus). Combinations like Mars-Venus, Mars- Rahu, Venus-Rahu, Mars-Saturn and Saturn-Rahu are high grade passionate lewd, licentious and immoral. Such persons lose their control on their selves and are therefore fickle and unstable minded. Unless passions of these planets are sublimated, one can not be passive and submissive and hence can not have the above said characteristics. To some extent passion of Venus is reduced by the conjunction of the Sun and that of both by the aspect of the Jupiter. Thus combination of Sun- Mercury-Venus and Mercury-Jupiter-Venus in mystic signs such as Scorpio, Sagittarius and Aquarius are philosophical. 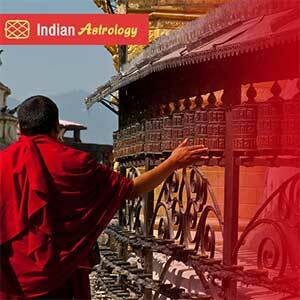 In Aquarius Sun, Jupiter, Saturn and even Rahu become religious, spiritual and philosophical. In the chart of Shri Chaitanya the ascendant is fortified by the aspect of its lord Venus which is aspected by divine Jupiter .It is well known that Venus in 7th house is full of lust and passion but it has been sublimated by the aspect of the Jupiter. In the chart of Sri Aurobindo there is a divine combination of Sun-Mercury-Venus in royal sign Leo, the conjunction of Mars-Jupiter in royal Cancer ascendant, Moon-Saturn in Sagittarius and shadowy planets in axis 5-11. This is a religious, ascetic and philosophical chart in all respect. Similarly, chart of Dr. S. Radhakrishnan reveals the philosophical dispositions of Sun-Moon in 12th house (place of salvation), Mercury-Venus in ascendant, Mars-Jupiter in mystic sign Scorpio in 3rd house and shadowy planets in 5-11 axis. The chart is fortified by Bhadra yoga, Durudhara yoga, and Ubhayachari yoga. The conjunction Mercury-Venus makes the native as pure as crystaI, generous, virtuous, and truthful beyond suspicion. It is observed in the charts of Pt. Jawaharlal Nehru and Dr. Radhakrishna. The planetary association and disposition conferred on Dr. Radhakrishnan a versatile and universally recognised personality. Combinations Sun-Moon, Mercury-Venus and Mars-Jupiter induced him as creative and original analyser, introspective, and interpreter of Indian religion, culture and philosophy. Chart of Lokmanya Bal Gangadhar Tilak has the planetary combinations Sun-Venus in ascendant, Moon-Jupiter-Rahu in 9th, Mercury-Saturn in 12th house and shadowy planets in 3-9 axis which have been proved of the same grade as observed in charts of Sri Aurobindo and Dr. Radhakrishnan. In chart of Pt. Jawaharlal Nehru and Dr. Radhakrishnan the combination Mercury-Venus is social, political, philosophical and relenting but pyrrhonic ( not ascetic and renunciant). In Sri Aurobindo’s chart the combination Sun-Mercury-Venus and in Tilak’s chart Sun-Venus, Mercury-Saturn, and Moon-Jupiter-Rahu are ascetic, relinquent, renunciant, social, political and philosophical but not pyrrhonic. Chart of Shri Krishna is a unique blend of animism, ascetism, animation, witwise- wisdom, chaste and logical mind, courage and bravery. 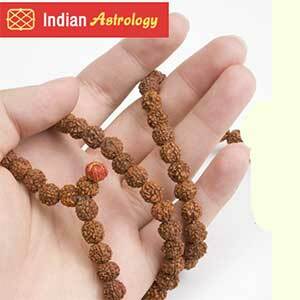 The association of Mars-Rahu in 3rd house is a significator of power, and courage. He defeated his all enemies The association of Sun-Jupiter in 4th house and in the 9th house of religion the moksha-karaka Ketu (all aspected by philosophical Saturn) are very spiritualistic. It is remarkable that Shri Krishna did not stress on renunciation but on work without the desire of consequence, as stated in the Geeta. Is this due to Mars- Venus-Rahu in 3rd house? The scientists should be considered as philosophers. Astrologically their charts reveal the similar planetary positions as observed in the charts of orthodox philosophers. Chart of Newton shows association of Sun-Mercury in the divine sign Sagittarius aspected by Saturn. Similarly chart of Einstein shows, a very good philosophical association of 4 planets Sun, Mercury, Venus and Saturn in 10th house and divine Jupiter in religious place, ie, 9th house. This is analogous to the chart of Gautama Buddha. In the same way, chart of President Dr. Abdul Kalam is an illustration of ascetism, renunciation and philosophy because of disposition of association of Sun-Mercury-Ketu in 10th house and aspect of Saturn there on. 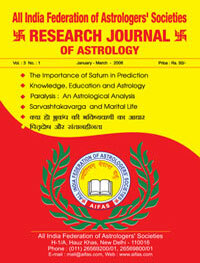 Similarly, disposition of Jupiter in mystic 8th place and its aspect on Moon existed in mystic sign Scorpio. Dr. Kalam is in fact a saint and seer because he has left his all physical comforts as he is still unmarried and living in a very simple manner even if he is in a palace.